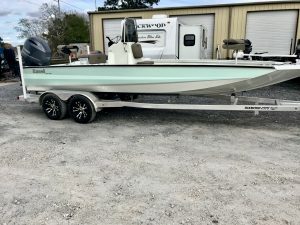 This is an Excel 220 Bay Pro with white hull and interior and a Seafoam stripe about to be picked from our dealership in Sulphur, La, and head to its new home in Texas. 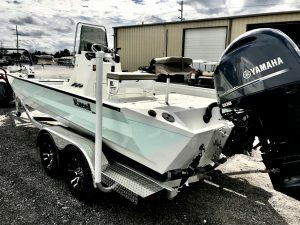 This is Excel’s 22′ aluminum bay boat powered by a 150hp Yamaha fourstroke outboard sitting on a tandem axle Diamond City aluminum trailer. 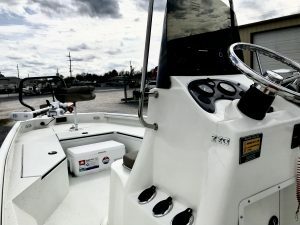 This Excel Bay Boat is rigged with a Minnkota Terrova Riptide trolling motor. 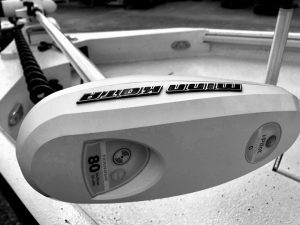 The popularity of the Minnkota I-Pilot trolling motors is a definitely a growing trend with our customers. It also has and Humminbird Helix 7 GPS/ Fishfinder on the console and a 3 bank onboard battery charger.